profit potential to increase your business revenue by being part of out referral program. You hold the potential to earn greater profits by just referring clients to VMS-Washinton when they sign up, without doing any extra work. Find clients you already have that do credit card processing or want a start a new account and just refer them to us. We will do all the work, all you have to do is the introduction. Once the client is processing with VMS-Washington we’ll share the revenue with you, which is 15% every month. You get this residual every month for the length of the contract which is typically 3 years and could be a as long as the person is in business processing though us. VMS-Washington invites you to join one of the most successful referral relationship programs in the industry. As a trusted leader in electronic commerce VMS has the tools and experience needed to create a profitable referral relationship for you. Our diverse portfolio consists of over 400 referral relationships of all sizes and business types, including; associations, financial institutions, franchises and internet companies. VMS-Washington will work with you to design a program that fits your specific business model. Whether your customers are just starting out or looking to switch processors, we can provide credit card processing solutions to help their business grow. Our Second referral program is a Referral Bonus. 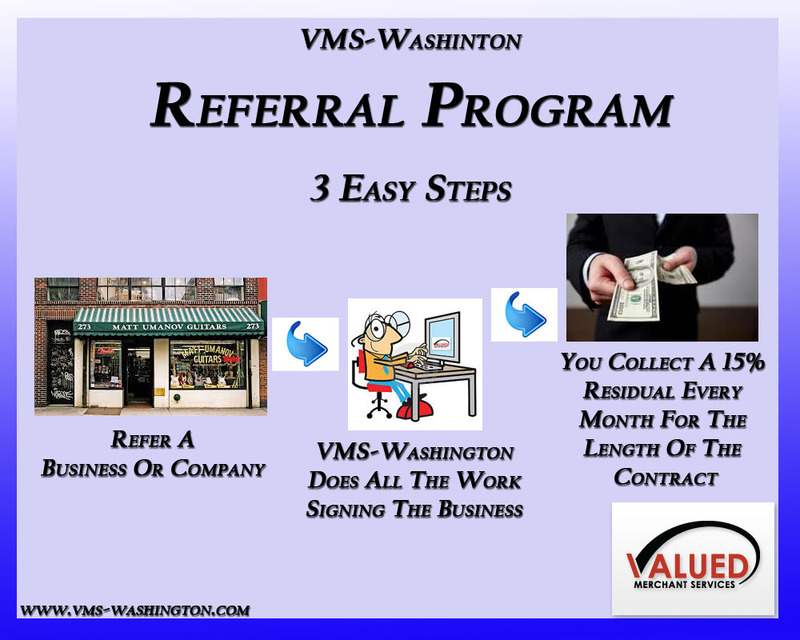 For every client you refer to VMS-Washington you get $50.00 when they sign up. For a larger bonus we offer $100.00 if the business has more than 20 locations and for 25 or more we will give you $200.00. For every referral that results in an open merchant account, you have the opportunity to make money and your customers have an opportunity to save money. Also if VMS-Washington cannot beat your current processor’s rate we will give you $500.00 cash. If We Cannot Beat Your Current Rate We Will Give You $500.00 Cash. If you’re interested and or want more information about your merchant services and better rates from an “A Rated” company contact us. VMS-Washington is having a Presidents Day Special till the end of the month. For a limited time we are offering rock bottom rates for new and existing businesses that want to save money, cut their costs and put extra cash in their wallet. 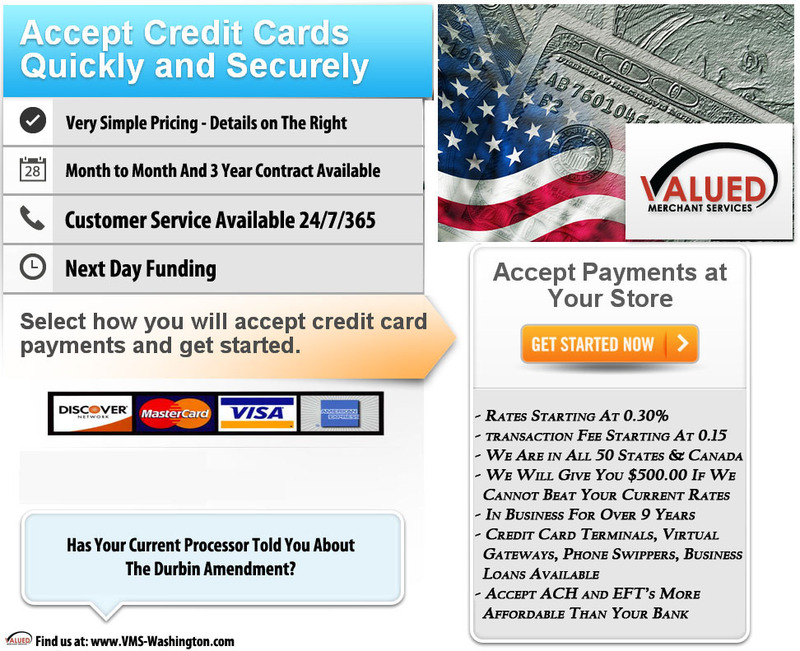 If VMS-Washington cannot beat your current rate we will give you $500.00 cash. Do they have a Referral Partnerships or Referral Bonuses? Would you want an A rated company that and will promote your business though their social media and monthly newsletters. We Can Save You 20-50% Off Your Current Provider.